Spinning has been much on my mind, as I've been trying to find time to do it (hopefully, Christmas crafting will soon be over!) And what I've been spinning, recently, is superwash merino. So. Here's the result of the first handspun superwash merino I ever spun. 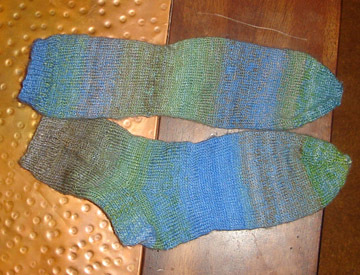 Also, the first socks I ever knit, strange to think that it isn't something I've always done. The puzzling thing, though, is that although I spun up just 4 oz of the stuff I had enough for just about two pairs of socks! I have spun more yarn for socks... with in the last year or so, but I have not yet sat down to knit it (them?). The colorway is (was?) Waterspout from Sakina Needles.